The Nonfiction Detectives: Two Books about Space! On November 26, 2011, NASA launched a high-tech rover, Curiosity. It’s mission: to study the planet Mars to understand how it was formed and how it has changed over time. 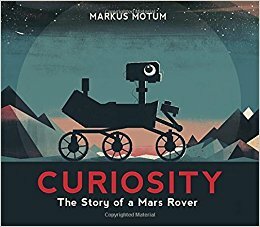 British artist, Motum uses the picture book format to the greatest advantage. His double-page spreads in mixed media offer an important visual element to this highly engaging narrative nonfiction book. Motum's Curiosity has quite the personality. Back matter mentions previous Mars rovers, a timeline of Mars missions, and a glossary. In this biography told in comic format, tells the story of Michael Collins, the third astronaut onboard the Apollo 11 mission. Collins was the person who stayed with the ship, orbiting around the dark side of the moon, while Buzz Aldrin and Neil Armstrong made the historic walk on the moon, July 20, 1969. The book briefly introduces Collins beginnings, but stays focused on his NASA training, his spacewalk while on the Gemini 10 mission, to his final trip to space aboard Apollo 11. Though other astronauts has orbited the moon (Apollo 8, 9, 10), Michael Collins was the first astronaut to orbit the moon alone. Drawing on Collin’s autobiography, the book never shies away from explaining the personal sacrifices Collins made to train for this historic mission and the disappointment he felt when not chosen to walk on the moon. Readers learn of the incredible skill Collin’s had since he was responsible for piloting the space craft, and pulled off docking The Eagle with the space capsule (The Columbia) in a maneuver never done before. Did Collins return to space after Apollo 11? No! He wanted to spend more time with his family. Eventually, Collins became the director of the Smithsonian Air and Space Museum. 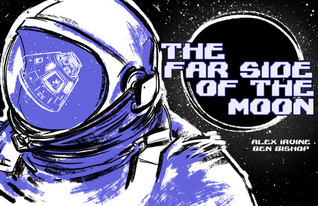 Using a limited pallet of black, white, and purple, Bishop’s illustrations are excellent and really bring the story of the third man from Apollo 11. Be sure to share both titles with children and families. These two books, and an older title, The Mighty Mars Rovers: the Incredible Adventures of Spirit and Opportunity by Elizabeth Rusch, are perfect for readers who can’t get enough information about space and astronauts. To write these reviews, I borrowed the books from my local public library.